The esperanto flag flies proud over Lawson Street. You step out into the morning rush. At the entrance hall of Redfern station, a dozen conversations blend into white noise and the crowd shuffles forward towards uni. Caught in a stream of commuters, you cross the road, resisting a tempting waft from the coffee shop. Uncompromising, the herd has little time for ponderous laggers, yet a brief glimpse of the green flag of Esperanto House leaves you curious. What is ‘Esperanto’, and why does it need its own house? Described by Wikipedia as the “most successful constructed language in the world”, Esperanto began in 1887 as the humble pet project of Dr Ludwig Zamenhof. His intentions were noble: not a fan of conflict, he created a language which, he hoped, could become international. Easy to learn and readily adaptable, Esperanto was meant to leave us all speaking at least two tongues, understanding one another better, and avoiding intercultural conflict. Unfortunately, Esperanto’s creation was followed almost immediately by two world wars. Despite this setback, its popularity is once again on the rise; in fact, Esperanto is the most popular constructed language in the world. Around one million people speak it as a second language and this number is growing as technology facilitates its diffusion. Its simplicity is key. While a capable English-speaker knows around 10,000 words, Esperantists can achieve the same complexity with only 2000. This is thanks to a highly malleable morphology, which allows speakers to coin words from comparatively few grammatical roots. Dr Rainer Kurz, former President of the German Esperanto Association, notes that he has “dozens of friends in dozens of countries using Esperanto”, and that it now exists in over 100 countries worldwide. Across Europe, the Americas, Australia, and Asia, enthusiasts use the internet to learn the language and organise local events. A huge array of Esperanto resources can be found online, from beginners’ guides to discussion forums for the most experienced speakers; there’s even an Airbnb-style app allowing Esperantists to stay with other speakers when they travel. Dr Kurz says in a week, he would be able to stay with “at least 10 different people in different countries” in places he has no personal connections. In our hyper-connected digital age, it seems anomalous for a globally diffuse language group to have its own fixed address. 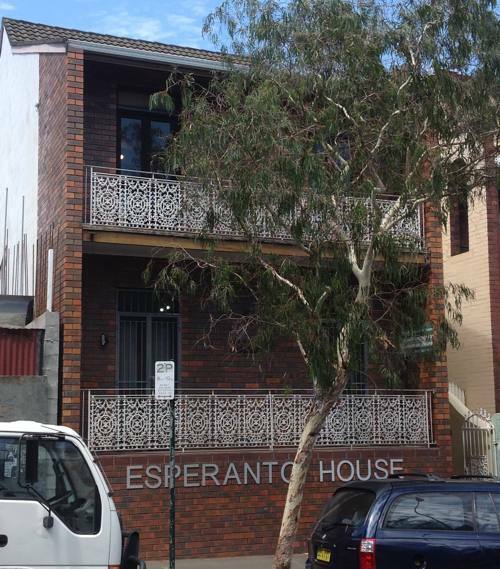 Yet, in one of the most expensive parts of Sydney, Esperanto House has stood as a local meeting place for nearly 60 years. The House has two main roles. It is an administrative centre, the headquarters of the Esperanto Federation of NSW and a repository for archive material. And it’s a cultural hub, regularly hosting information sessions, meet ups, and pizza nights. Importantly, it also offers Esperanto-speaking guests fourteen days of free accomodation. This isn’t just charitable; it promotes the kind of cultural integration Dr Zamenhof originally envisaged. Where natural languages have specific geographic and cultural roots, Esperanto is global, facilitating the interaction of otherwise unconnected peoples. Through repeated inter-cultural exchange, Esperanto has developed its own unique identity—the House itself contains a small library of original and translated books, the language has a burgeoning music scene, and around a thousand people consider Esperanto their native tongue. But for a global language, Esperanto seems remarkably localised. Its membership is introspective, focused primarily on maintaining the existing community rather than converting the general populace. Its size has indeed been growing—it’s one of the only minority languages in recent decades to have seen an increase in usage. But in the absence of any coordinated or substantial advertising, this is likely due to the passion of enthusiastic linguists taking it upon themselves to learn the language. This default preference for English is a major factor in the decline of minority or indigenous languages, and innovations like Delamore’s can be used to help preserve dying languages. But some might question Esperanto’s goal of simply replacing English as the new lingua franca. In the melting pot of the modern global city, the promotion of another Eurocentric language may not be the best way to slow the cultural steamroller of Westernisation. In many ways, the renewed popularity of Esperanto may stem from a sense of social guilt. For many people it is a struggle trying to learn English, ranked as the 33rd “weirdest” language by the World Atlas of Linguistic Structures. Esperanto, as a simpler, more approachable equivalent to English offers an alternative. In Dr Kurz’s experience, for example, the language was his only means of communication while on an exchange program in Japan, and while not everyone speaks Esperanto in Japan, he found that it was actually “the only common language with most of the people”. By the end of a month’s travel he was asked to give a lecture on satellite navigation at Tokyo University—in Esperanto. The key idea of Esperanto is that of shared difficulty. In agreeing to speak an invented language, all parties place themselves at an equal but reasonable disadvantage. With English becoming one of the great homogenising forces of the modern era, anglophiles in the West could learn a lot from the inclusive linguistic community that is Esperanto. So next time you’re bitter about those darned international students not speaking English properly, consider a visit to Esperanto House before you message the USyd Rants Facebook page.